Libertarians hail the potential for blockchain to radically transform society according to their vision (Source). However, the open source nature of blockchain makes it equally accessible for governments and corporations to use it for tightening their authoritarian grip. The blockchain is a general purpose technology like TCP/IP (internet protocol), the general processing unit, and electricity. Early adopters of the internet touted its potential to unite and democratize the world but did not anticipate mass government surveillance, fake news, or targeted advertising. Likewise, blockchain raving libertarians may be disappointed by the outcome of such technology in authoritarian hands. Until now, the term “blockchain” has been used to refer to public blockchains like the bitcoin blockchain. Private blockchains are maintained and built by miners and nodes that are under private control. Governments and some startups have used private blockchains to maintain control over the infrastructure and network that builds their blockchain ledger. These blockchains can be distributed but are not decentralized. China recently announced a successful trial run using its own government-backed cryptocurrency within its centralized banking system (Source). Japan, Korea, Sweden, Estonia, The UK, and The United States have all expressed similar interest in creating a blockchain based digital currency (Source). A government-backed cryptocurrency would allow governments to easily track all transactions and control nearly every aspect of the use of their digital coinage. In 2014, China announced its plan to roll out a nationwide social credit system and enlist every Chinese citizen and business by 2020 (Source). In the United States, we are familiar with financial credit scores that are calculated based on an individual’s financial history and are used to determine an individual’s likelihood to repay a loan. Social credit scores are like reputation systems calculated based on the sum of an individual’s actions in a society and are used to gauge the trustworthiness of an individual (Source). In a social credit system, an individual’s score can determine who he marries, what job he is eligible for, how much he pays for insurance, and whether he can operate a business (Source). It seems Orwellian, especially when China plans to use the individual’s internet browsing habits as a criterion for calculating the score. The chief technology officer, Li Yingyun, of Sesame Credit, the Chinese corporation currently running trials of this future social credit system, said: “Someone who plays video games for 10 hours a day, for example, would be considered an idle person, and someone who frequently buys diapers would be considered as probably a parent, who on balance is more likely to have a sense of responsibility” (Source). It is unclear if Sesame Credit plans to use blockchains for their final version of the social credit system. However, China’s interest in blockchain and their development of a government-backed cryptocurrency suggests that they are not shy to explore applications of this technology. As mentioned previously, smart contracts operating on a public blockchain can create a scalable reputation system. Using private blockchains, China can more securely manage their 1.3 billion citizens’ data and credit scores. Ultimately, this allows a centralized source of mass social control through behavioral incentives. In 2013, Cyprus startled citizens when it announced that it would seize up to 60% of personal savings over €100,000 to bail out it’s dying banks (Source). Demand for bitcoin exploded as citizens reacted by moving their euros to crypto to keep it out of government hands (Source). Just a year later, China first declared its ban of all things bitcoin alongside its plan for a social credit system. Today, bitcoin looks more like an asset or a business-to-business payment network and less like a currency for the masses. Regardless of Satoshi Nakamoto’s original vision for bitcoin, his blockchain invention soon became recognized as an open platform allowing permissionless innovation. The technology shows promise for real societal change with applications in every industry. However, the course of change this technology brings will depend heavily on the motives of the people who build with it. It is up to the next generation of tech entrepreneurs to provide blockchain-based services unreliant on authority because the alternative is the authoritarian power that we have seen emerge from governments and Fortune 500s alike. Power that tends to corrupt; absolute power that corrupts absolutely. In reality, we will likely see a mix of both authoritarian and libertarian applications using blockchain. 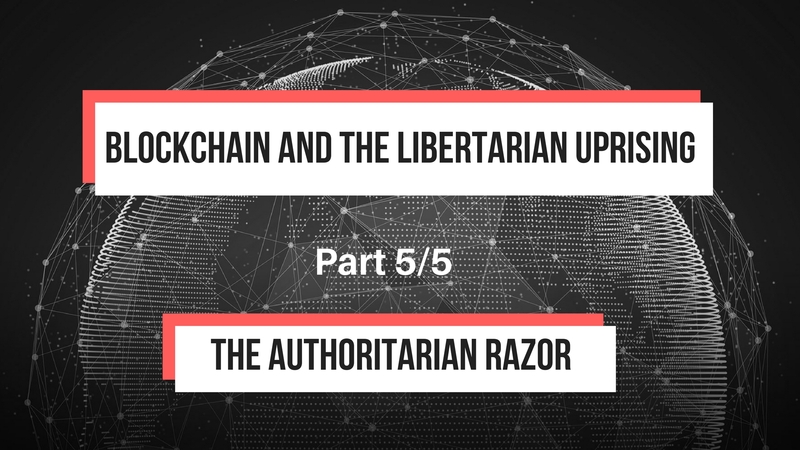 The authoritarians, however, will likely find it difficult, nigh impossible, to regulate their libertarian rivals operating with distributed and decentralized blockchains. Much in the same way that bitcoin is unstoppable by any third party. This leaves the market to decide which services will be deemed fit. Bitcoin and blockchain cannot be uninvented; the benefits are promising. We do not know what this new era of trustless global economies will bring, but we are about to find out.